How did June get here so quickly!?!? The weather has definitely been nice here in Cincinnati the past couple weeks. 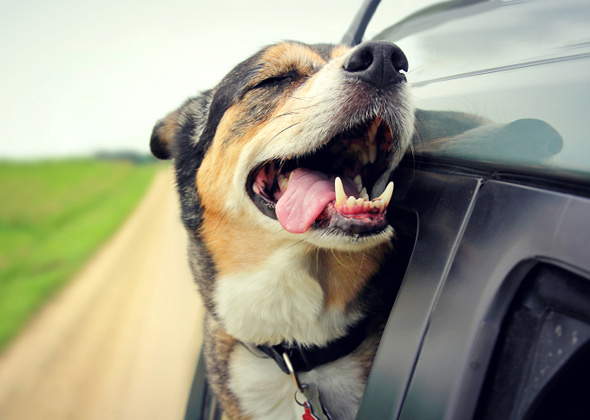 For a lot of canine companions, going on a car ride is a lot of fun, especially when the weather is nice! Some get to stick their faces/heads out the window and feel the breeze. Some get to roam around the car just waiting in anticipation of their destination. Some sit on the lap of the driver and relax. Despite the joys of all of these situations, they are all VERY dangerous habits. I know, I know, we just busted your bubble… sorry! But please read on. In the first decade of automobiles some cars didn’t have windshields and all driver’s were required to wear safety goggles. The same is true today with motorcycle operators. In the state of Ohio all motorcycle operators and passengers are required by law to wear safety glasses/goggles. The reason for this is when you are traveling at speeds of 25mph+ even the smallest particle (pebbles thrown up by the tire of the car in front of you, rocks, bugs, etc) becomes a projectile that will obliterate your soft tissue eyeball in a millisecond. So why is this any different for a dog? It isn’t. The second safety concern is our dog’s ears. When a dog’s ears flap in the wind this can cause extreme pain and tenderness as the cartilage in their ears were not designed for that kind of force. The eardrums and inner ear canal can also be permanently damaged from the constant flapping of the ears and from the high wind itself. Debris and dirt will also work it’s way deep down into the ear and can cause infection and irritation. The ears of dogs were not meant to withstand a 35+mph wind, especially for a long duration. The third concern is a crash. Imagine if your dog’s head is sticking out the window and you are hit head on by another vehicle while you are traveling down the road. At the very least the result will be extreme injury but will probably end up being fatal. As mentioned above, if we (humans) are in a severe collision (or even a mild to medium collision) we are protected by seatbelts, airbags, and vehicle engineering that lessen the blow for us passengers. When a dog is not being restrained or supported in any way as a passenger they become a projectile during a collision and will sustain severe injuries, and in some cases, will go through windshields. Dogs can even cause severe injuries to human passengers for this very same reason. Allowing dogs to travel in the bed of pick-up trucks is an even worse option as there is absolutely no cushion or restraint during a crash or accident, and during hot days the surface of the bed of a pick up truck can reach very high temperatures causing damage to the tissue of a dog’s paw. As mentioned above this becomes a very big safety concern, but even more so that letting your dog free roam. Most cars these days are equipped with airbags (steering wheel and often side curtain) that deploy at over 100mph. When a dog is in the driver’s lap the airbag will deploy in a crash and cause severe trauma to the dog and the driver. So the good news is there are many safer options for pet travel. Having a travel crate/kennel in the car helps with all of these issues. In the event of a collision the dog is contained as much as possible and will be stopped by the surface of the crate. Another option is utilizing a pet safety (seat) belt (harness option is the best) which will stop their momentum (just like our seat-belts) in the event of a collision. And finally, a pet barrier (a barrier between the driver/front seat passenger and the rear compartment) is a better option but not the best as the dog is least restrained out of these three options. Go ahead and roll the window down or crack the window and let your furry friend enjoy the breeze and all the smells that come with it, but no heads out the window! And as always, we look forward to helping you with all your dog training / rehabilitation needs!